House Of Horrors: Prices Still Declining In Half Of Measured Countries. The bursting of the global housing bubble is only halfway through. The latest update of The Economist’s global house-price indicators shows that prices are now falling in eight of the 16 countries in the table, compared with five in late 2010. To assess the risks of a further slump, we track two measures of valuation. The first is the price-to-income ratio, a gauge of affordability. The second is the price-to-rent ratio, which is a bit like the price-to-earnings ratio used to value companies. Just as the value of a share should reflect future profits that a company is expected to earn, house prices should reflect the expected benefits from home ownership: namely the rents earned by property investors (or those saved by owner-occupiers). If both of these measures are well above their long-term average, which we have calculated since 1975 for most countries, this could signal that property is overvalued. Based on the average of the two measures, home prices are overvalued by about 25% or more in Australia, Belgium, Canada, France, New Zealand, Britain, the Netherlands, Spain and Sweden (see table). Indeed, in the first four of those countries housing looks more overvalued than it was in America at the peak of its bubble. Despite their collapse, Irish home prices are still slightly above “fair” value—partly because they were incredibly overvalued at their peak, and partly because incomes and rents have fallen sharply. 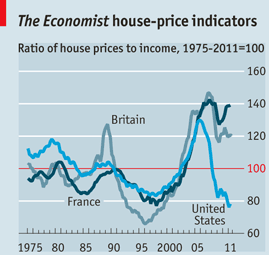 In contrast, homes in America, Japan and Germany are all significantly undervalued. In the late 1990s the average house price in Germany was twice that in France; now it is 20% cheaper. This raises two questions. First, since American homes now look cheap, are prices set to rebound? Average house prices are 8% undervalued relative to rents, and 22% undervalued relative to income (see chart). Prices may have reached a floor, but this is no guarantee of an imminent bounce. In Britain and Sweden in the mid-1990s, prices undershot fair value by around 35%. Prices in Britain did not really start to rise for almost four years after they bottomed. That analysis is about as good as mainstream media gets. However,The Economist fails to address the global implications. What happens if home prices plunge (and they will) in Australia, Belgium, Canada, France, New Zealand, Britain, the Netherlands, Spain and Sweden? How will those central banks react? Except for France which has no direct control, I will tell you how. Central banks will cut interest rates and/or launch various quantitative easing programs. All other things being equal, that is net US dollar supportive. Moreover, if prices and transaction volumes collapse in China (and they will), what will that do to the demand for commodities? In turn, what would falling demand for commodities in China do to the economies of Canada and Australia? However, The Economist fails to discuss the possibility that US rents are artificially high due to people seeking rental properties after being foreclosed on. Moreover, income statistics are very skewed. Most of the gains in income are on the “high end”, not people in financial trouble. Still, as I said, this article is about as balanced as one can expect from mainstream media. It provides much opportunity for further commentary (both positive and negative) from bloggers. However, it’s the non-discussed ramifications that are important.